Simply getting to Antarctica is a big enough adventure for many. But for those in good shape, keen to don crampons and ice-axe and itching to get deeper into Antarctica, this is definitely one for you. To take part in the mountaineering activities you'll need to be fairly fit - you should be fairly regular walkers and happy with quite rugged terrain. 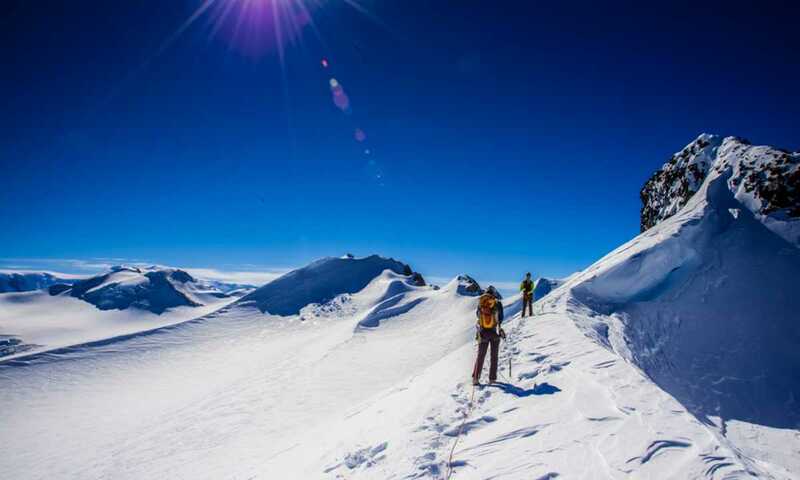 Most mountaineering options are open to anyone who would like to experience what it’s like to rope up, wield an ice axe and try your hand with crampons. Prior experience is helpful, but typically isn’t mandatory, except on the gnarlier multi-day expeditions. Mountaineering isn’t widely available on Antarctic trips, so choose your options carefully from those ships which do offer it if this is definitely on your ‘must do’ list. 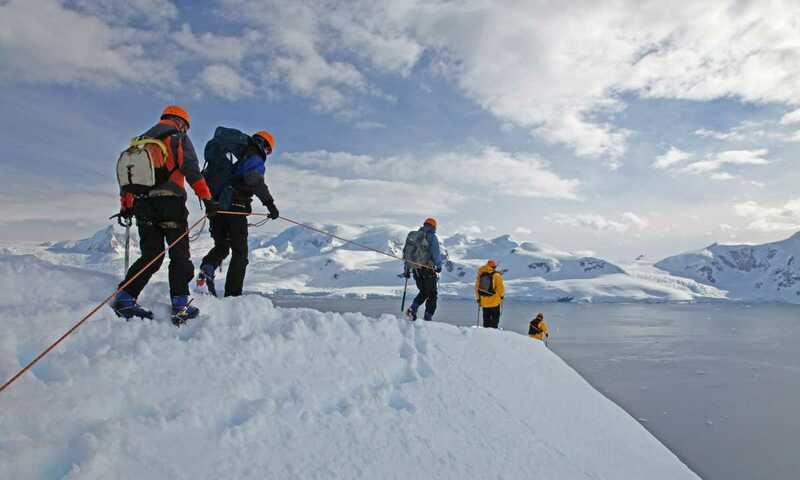 In terms of how the more common and universally accessible mountaineering activity works, under the guidance of a qualified guide you’ll spend 3-4 hours roped up, as part of a small group, getting well beyond the scope of most Antarctic visitors. Your efforts will be rewarded by dramatic vistas and the knowledge that you are the only people in that whole area. The more specialist climbing equipment will be provided for you; including ropes, harnesses, helmets, ice axes and crampons, as well as snow-shoes when required. Along with the right clothing, all you need to bring is a sturdy pair of boots with a rigid sole for the crampons. Soft hiking boots and trainers aren’t appropriate. You have the option to either join a Basecamp Adventure, which includes a half day’s mountaineering in the voyage price - along with a host of other adventure activities - or sign up to mountaineering as an additional activity, with an extra charge of ​​$575 - $1,250 per person​​, depending on ​nature and duration of the activity. Kitting up with crampons and ice axe to explore Antarctica’s deeper secrets routinely receives rave reviews. Perfect for novices who want to give it a try, without getting too technical. We went up steep hills and got amazing views. With a guide in the front and back, so you felt very safe. Do I need any qualifications to do this activity? For the soft adventure option you don’t need any previous experience. Its aimed squarely at the novice who may or may not have done this before. A qualified guide will accompany you and help with the kit. What specialist kit do I need to bring? All of the required kit (ropes, harness, helmet, crampons and ice axe) are provided. However it's important that you bring the right kind of rigid-soled mountaineering boot capable of taking crampons, otherwise you won’t be allowed to do this activity. How tricky are crampons to wear? As with everything you try for the first time, it's a little awkward to begin with but you quickly get the hang of them. By the end of the session you’ll be ready to tackle Everest! Do I need to pre book? If choosing to do mountaineering as part of a Basecamp Adventure you will need to tick this activity on your activity form. Otherwise if you are choosing to do it as a standalone additional activity, due to the limited size of the group you should secure your places at the point of booking your cabin.